Thanks to Roger Davy for the photo of his father and accompanying text and Armistice Day diary entry. After joining up my father left 4 Jackson Street in Sutton, and his work as a textile waste merchant with his Uncle Stephen Davy in Bradford. After initial training at Crystal Palace he was sent to Falmouth where he joined a flotilla of minesweepers that had been converted from trawlers. He was a radio telegraphist in radio's rather primitive days and took 'watches' listening for German submarines below the waves using ear-phones attached to a long piece of rubber tubing submerged beneath the water! 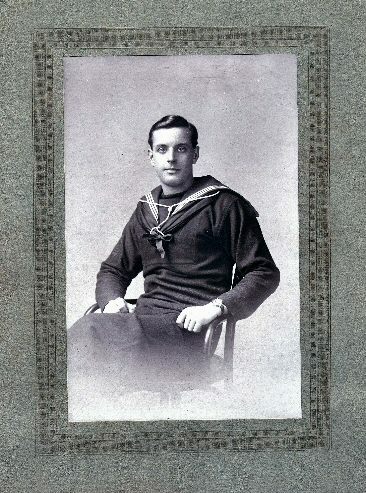 His group was credited with sinking a German vessel off the Lizard in 1917. Happily Dad was one of Sutton's sons whom came home. The Mr and Mrs Moss in Falmouth were members of the Baptist Church there and 'adopted' Dad when he was on leave. They had three daughters and my father eventually married the youngest Doris and he brought her home to Ilkley where they lived all their married life. Their graves are in the Baptist churchyard in Sutton. Got up as usual at 6.50 about and after doing what was necessary in the office and having breakfast it was nearly 9.15. I looked out of the centre window in the office and saw that the tugs and many of the ships had their answering pendant flying. They all were reading a general signal from the base in which the news was given that hostilities were to cease at 11 o'clock. There was a cheer came from many of the ships crews especially the men of the motor launch crews among whom there was not a little excitement. Within two minutes or so after the signal was completed almost all the whistles of all the ships which had steam were blowing, making such a noise that it was extremely difficult to hear anyone who shouted in my ear. The ships soon had their flags and pendants flying and were dressed within an hour or so. It was a grand morning and though cold we all were outside watching the firing of rockets and Very lights and listening to the hooters and gunfire. It was a busy time for signal men and yet their duty was a grand one. The work of the base ceased and men from docks and foundry gave over working and had a holiday. By 11.00am �Rovenska� fired a Royal Salute and there was a then a slackening off of siren blowing. It was announced that a party of men should go from the base to a thanksgiving service held on the moor. Lt. Newham was in charge of about 50 men and Harry Place and I walked up together. There was a good bit of singing while we were marching and the streets were well flagged and most of the people were out � all seemed very happy and suitably excited. The new Mayor Mr Charles Spargo presided over the meeting on the moor. The Salvation Army provided the music, the Rector offered a prayer after we had sung the doxology and then the mayor gave a short speech and asked that the people should enjoy themselves but he hoped that there should be no repetition of Mafeking Night. After the National Anthem was sung we returned to Base. Harry and I were almost the last to fall in at the muster after the service for I had just had a word or two with Mrs Moss. Capt. Stopford and Commander Collett were on the platform at the service. Went to the usual house at night and though I was pleased that the Armistice had been signed yet I felt that we had closed one chapter of deadly strife and had opened with that another chapter of domestic strife. I felt as though the unity which has been with us during the war has come to an end and political and party strife will come almost at once. The question of a general election is one that is often spoken and written about which I think is necessary if only all the voters are able to register their votes. At 7.00pm went with Mr and Mrs Moss and Miss Haddon of Penzance to the United Meeting of Free Churches held at Wesley Chapel and under the presiding of the mayor Mr. Charles Spargo. After singing the first hymn Rev. Davies offered a prayer and later the Mayor gave a nice address. Mr Murphy also gave an address in which he said that had it not been for the killing of our lads he would have liked the German people to have felt a little more of the horrors of war. This would have made the peace more secure in the future. It was a very fiery address and one which received approvable by almost all who heard it. Still I don�t know hardly how the people thought on the point above mentioned. I went back to 'Pencarn' but couldn't stay longer than 10.00pm. It was 10.25pm when I reached base but no trouble was given me to get in. I have seen a merry crowd in the street, I did not see much but hear the singing and shouting. At 11.00 or so when Harry and I had turned in, the hooters of some of the ships were again set a blowing. I felt not a little annoyed and though they did not trouble me a great deal yet I did not care disturbing even a little. I had sent a wire to home and one to Sarah.